Empire Medical Associates (Maplewood) - Book Appointment Online! 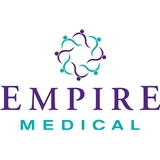 Empire Medical is a multi-physician, multi-specialty medical practice with more than 6 locations serving the communities of Union & Essex Counties. In addition to offering the highest quality, compassionate healthcare in the fields of primary care, family medicine and internal medicine, Empire Medical more than 30 highly skilled practitioners in 20 sub specialties ranging from cardiology and endocrinology to OB/GYN, gastroenterology, dermatology, nephrology, infectious disease, podiatry and ear, nose and throat. In this way, we are able to care for you in all ways throughout all stages of your life. As we have grown, it would have been easy to lose sight of the more compassionate side of medical care. That’s why, as a group, we have made it our mission to maintain that small-time doctor’s office feel while delivering complete care. For more information, please check our website! Very thorough for an annual check-up. She was very kind and calm, thorough with explanations and not rushed at all. Dr. Jacob-Issac is great - she is extremely knowledgeable and professional. She explains things thoroughly, while helping to make me feel some responsibility for my own health.